WORK IN PROGRESS - Still editing. This page is not yet finished ! Here are links to information on everything Mod 12. The campaign is split into three paths . 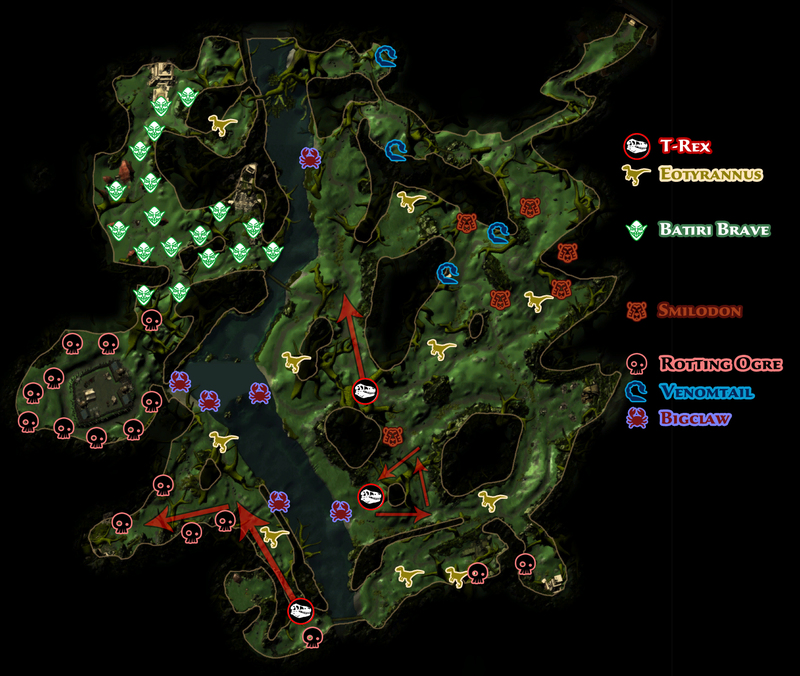 The left one is called 'Monster Hunt' and it allows you to advance in the hunting feature. The middle one - 'Advancement' - unlocks the new dungeon - Tomb of the Nine Gods - and the right hand one unlocks the boons. Quests grant you Chultan Riches and Chultan Totems; the totems are limited to a weekly haul of 100.Tthe top right 'Weekly Haul Bar' in the campaign window shows how many totems you have. Progression is faster if you take the middle path as you are able to earn an additional 25 totems from 'Star Hunts' which do not count against the weekly cap. A new feature in this mod are the 'Star Hunts' which are farmed in Soshenstar River. You need two requirements to do the Hunts. First of all you have to unlock it in the campaign. Secondly you need lures. You need a T-REX Fang and one other trophy which can be used together to buy a lure from the NPC in Port Nyanzaru. T-Rex fangs are needed for every lure. Presently you can only have one T-Rex fang in your inventory at any one time (you can mail them to alts however). from Mod 13 I believe you will be able to hold more than one in your inventory but they will not stack. The 1 star Hunts drop trophies which can be traded for lures for 2 star Hunts. The three trophies from any of these can be used for the 3 star hunt the 'King of Spines'. The lures have to be pleased in specific locations in Soshenstar River.